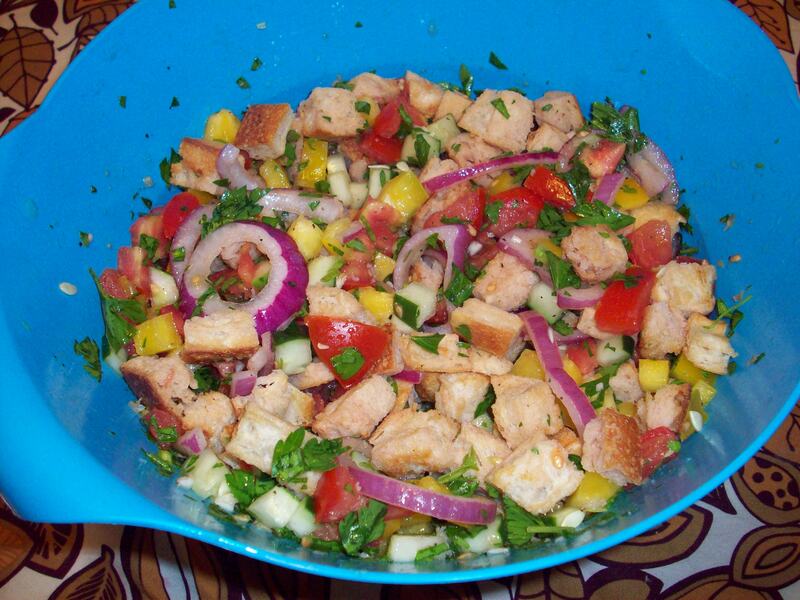 This is a delicious and refreshing summer salad. Make it a day ahead for even more flavor! It probably won’t last much longer after that…so be sure to keep that in mind. If you need it to last a bit longer, keep the bread cubes separate and mix them into each serving. That will prevent the leftover bread from becoming mushy. 1. Preheat oven to 400 degrees F. Line a jelly roll pan with foil and spray with non stick cooking spray. Arrange your bread cubes on the pan in one layer and toast 10-15 minutes, tossing once, until evenly browned. 2. Combine tomatoes, onion, oil, vinegar, garlic, salt and pepper in a large bowl. Let stand at room temperature for 30 minutes, tossing occasionally. 3. Add remaining ingredients to tomato mixture and let stand at least 15 minutes to let flavors blend together. Add bread crumbs just before serving. Mix to combine. If you care to compare recipes, this same salad was featured yesterday on TheKitchn.com.